A nanoparticle can have subtle effects on the activity of genes expressing enzymes that address oxidative stress inside two types of cells, although they are commonly used in food, cosmetics, sunscreen and other products. For example, according to a new study, while the titanium dioxide (TiO2) nanoparticles are considered non-toxic because they don’t kill cells at low concentrations, these cellular effects could add to concerns about long-term exposure to the nanomaterial. Titanium dioxide nanoparticles help make powdered donuts white, protect skin from the sun’s rays and reflect light in painted surfaces. In concentrations commonly used, they are considered non-toxic, though several other studies have raised concern about potential effects on gene expression that may not directly impact the short-term health of cells. 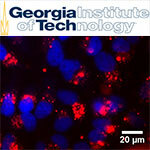 To determine whether the nanoparticles could affect genes involved in managing oxidative stress in cells, Payne and colleague Melissa Kemp – an associate professor in the Wallace H. Coulter Department of Biomedical Engineering at Georgia Tech and Emory University – designed a study to broadly evaluate the nanoparticle’s impact on the two cell lines. They separately incubated HeLa cells and monkey kidney cells with titanium oxide at levels 100 times less than the minimum concentration known to initiate effects on cell health. After incubating the cells for 24 hours with the TiO2, the cells were lysed and their contents analyzed using both PCR and Western Blot techniques to study the expression of 84 genes associated with the cells’ ability to address oxidative processes. Payne and Kemp were surprised to find changes in the expression of six genes, including four from the peroxiredoxin family of enzymes that helps cells degrade hydrogen peroxide, a by-product of cellular oxidation processes. Too much hydrogen peroxide can create oxidative stress which can damage DNA and other molecules. The effect measured was significant – changes of about 50 percent in enzyme expression compared to cells that had not been incubated with nanoparticles. The tests were conducted in triplicate and produced similar results each time. The research suggests a re-evaluation may be necessary for other nanoparticles that could create subtle effects even though they’ve been deemed safe. Those subtle differences may matter when they’re added to other factors. The research TiO2 Nanoparticles Alter the Expression of Peroxiredoxin Antioxidant Genes was reported online May 6 in the Journal of Physical Chemistry C.